As we approach the start of the new year, many of us take this time to purge the old so we can make room for the new, whether it be goals, attitude or just plain stuff. This is a time we tend to donate gently used clothing, furniture or anything else that would benefit someone else in need. We also tend to rid our closets (and life) of things we no longer need because they are used up or no good to us anymore. The same process applies to cosmetics and beauty products as these, like food, have a shelf life of their own. So when, you ask, is it time to say goodbye? Well it depends on the item. Now don’t be scared – let’s hold hands and do this together. I know many of you are keeping old makeup or hair products around for the same reasons I am – one being money. You feel you spent x amount of dollars on a product and whether or not you used it, you feel you should keep it around, lingering in that linen closet, staring you down every time you open it. You need to think about cosmetics the same way you’re thinking about those clothes – if you haven’t worn that lipstick in a year – well the odds of you picking that up tomorrow are very low. There is something that doesn’t get you jazzed up about that item, whether it be the color, formula or maybe you just found something better. Why don’t you put it and yourself out of its misery and throw it away? Most items that you use on your face should be gone within a year and a half (unless its mascara) but my rule of thumb is one year and you’re out. Seriously- why are you keeping it? For the one time you MIGHT use it? Odds are you won’t so get rid of it now. Any kind of lip product should be a year or less, especially if you were sick when you used it. Mascara that has been opened and used should only be kept around for three to four months. That’s usually no problem for me, because I love to change up my mascara often. Same goes for eyeliner. Think of all that bacteria its harboring! Hair products are much longer for obvious reasons but I still say if you have been looking at the bottle of hair serum for a year and are passing it over day after day, its taking up space. Time to say goodbye. So what about your unused items that you haven’t touched but know you won’t? What about all those little mini samples you won’t use but just can’t throw away? Well there a few options. My first thought is return it if you can. Sephora has changed their return policy so that you now need a receipt in order to return an item, but other than that you shouldn’t have a problem. Ulta and Nordstrom both have time-tables on their return policies and Ulta will only let you exchange your items, not giving you your full refund (you might want to note this when purchasing there). Returning not an option? Give it away. If you have something you know you won’t wear because its not your color choice, give it away. Chances are your sister/cousin/mom/coworker might love that color and you will be saving them dollars. Better yet, plan a beauty swap with your girlfriends where you all bring gently used (and acceptable) products that you don’t want anymore but can’t bear to throw in the trash. Same goes for curling/straightening irons, etc that you have too many of or didn’t work out. Hopefully this gives you the push to throw away or donate some of those items you have been eyeing in your makeup bag. I will be doing it too so strength in numbers! Beauty and Storage… my two favorite things! Recently I was asked to write a blog post about how I organize my makeup and boy was I excited. Just as much as I love beauty products, I equally love organizing them. There are two ways you can store your beauty loot – covered/tucked away and showing them off at all times. For those that know me I’m sure you’re not surprised that I love option number two. It’s not that I’m showing them off really, but more happily gazing at my collection of mascaras, eye shadows, blushes and nail polishes and how they are neatly displayed. I find that this option is right for me because it not only makes me happy but it allows me to keep inventory of products that I own so that they do not go unused (you know what I’m talking about – “oh, heyyy, I remember this lipstick from a year ago!”). 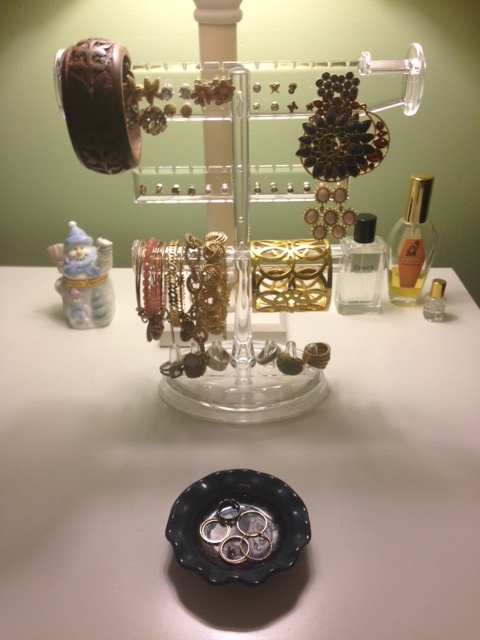 I really like the acrylic organizers that you can purchase online or in stores like TJMaxx, Target or Marshalls. I actually got my collection at a combination of The Christmas Tree Shops as well as ideel.com but you can find similar ones online. I like these because they provide a lot of different storage options depending on how much beauty merchandise you need to organize, the type and how you need to see it (some have drawers, while others swivel). 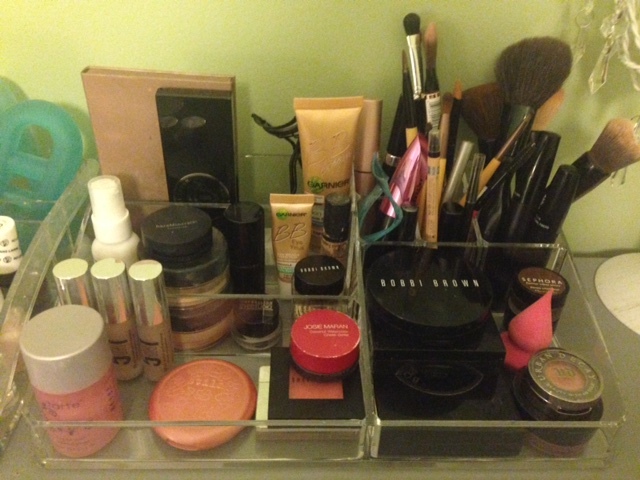 Below are pictures of my beauty organized (forgive the picture quality). As you can see I like everything in its place and I also like to see everything clearly. While I could not find the exact ones online you can click below to the links I provided for you to get an idea of what works for you. This isn’t beauty but I had been searching for a jewelry organizer to display my bracelets, earrings and rings in an organized fashion and am so excited I finally found this. Doesn’t it look like a store display? Everyday I feel like I’m shopping… my own jewelry! Not into displaying all you have? Or maybe you have less space than you would like and need to have your beauty stored away. No problem. When I travel, I take my necessitates into one bag without any pockets so that I don’t miss anything. How cute are these ones below? And for those that are experts, check out the one below! How do you like to organize your beauty stash? Traveling this holiday season? Me too. I was asked today to publish a post on what essentials I was bringing on my holiday getaway as some of you might be flying or driving in the next few days and can’t bring your entire beauty bag with you. So what should you bring and what should you leave home? Here’s what does and doesn’t make the list for me! Tinted Moisturizer/BB Cream/Foundation – whatever your preference in skin enhancement, bring it with you. It doesn’t matter if I have great eyeshadow or lipstick on for me if I don’t have my skin covered first. Concealer – I use mine daily as an under eye corrector and for any imperfections that might arise. Bronzer (if you use one) – I also use this daily so for me not to wear it would make me feel…well not right. Blush – here is where I would choose a cream color and use it as a multi-tasker as a lip color as well. My favorites are Bobbi Brown and Josie Maran – I actually keep them in my purse all the time. Eyeshadow – pair this way down if you can. I would stick with neutrals that you are going to wear every day/night and get the most use out of. I would choose a vanilla and a cocoa color as your take alongs. Bonus – bring a flat brush and use the cocoa as your eyeliner. Mascara – bring whatever you would normally wear but pair down to just one (or two if you’re like me). Gloss – if you chose a powder blush instead of a cream, make sure you pack a gloss you feel good about wearing everyday. I would stick with a pink or soft brown. Reds are really fun for holiday but if you’re not going to wear it everyday this weekend, leave it home. Dry Shampoo – depending on how many days you will be away from home you may not have time everyday to wash and do your hair full out everyday. I would bring along some dry shampoo just in case. Coconut Oil – if you don’t have any right now, go out and buy some before you leave. I love this stuff! I use it as my body moisturizer as well as many other things. I rub into my cuticles before I go to bed, use it as lip balm and use on my eyebrows to keep them in place. You can also use it on the ends of your hair to keep your style in place and flyaways down. Girls with longer and finer hair should go easy (remember this is oil) but girls with thicker or a short hairstyle can load up a little bit more. It can also be used as a gentle eye makeup remover. Bonus – if you purchase the organic, unrefined kind it smells amazing. Highlighters – these are so flattering but will take up room in your bag. My advice? Bring a vanilla sheen as your vanilla shadow above and work it as double duty. Fun lip colors – I always end up bringing way too much and only use one that is in my purse. Choose one staple that you can wear all weekend and keep it natural. Loose eye shadows – besides the two I suggested above, I would avoid bringing any more. If your shadows are in a palette, go ahead and feel free to bring that. Remember if you’re away visiting family, you’re probably not going to have a ton of time to try new makeup tricks or colors, so stick to the basics and tried and true colors that you know work for you. Nail polish – do it before you leave or let them be natural. I would avoid bringing any color along. Better yet – go get your nails done with the women in your family as a girls’ day date! Remember – when you’re deciding what to bring ask yourself this “Am I REALLY going to use this in the next few days?” If the answer is I don’t know, leave it home. You probably won’t miss it. What are your traveling beauty essentials? Two new mascaras… and a new baby!